Discovery Center 5 is an ADA accessible outdoor playground structure for kids 2 to 5 years old that encourages growth, socialization and learning. The Discovery Center 5 allows up to 25 children to play, imagine and connect. The adventures begins via the 1-2-3 Step Stairs or the Vine Climber making way to platform where 7 activities await including the choice of an exhilarating ride down either the Straight or Curved slide. The experience continues at ground level with activities altogether helping promote the 8 early childhood essential standards. The combination of Telescope, Gear, Shapes & Colors and TouchMath® panels, Rain Wheel and Bongo Drum is capable of providing hours of fun, while teaching problem solving skills and improving hand-eye coordination. An attached roof enhances the attractive aesthetic and creates a source of refuge to rest in a cooler, shaded space. 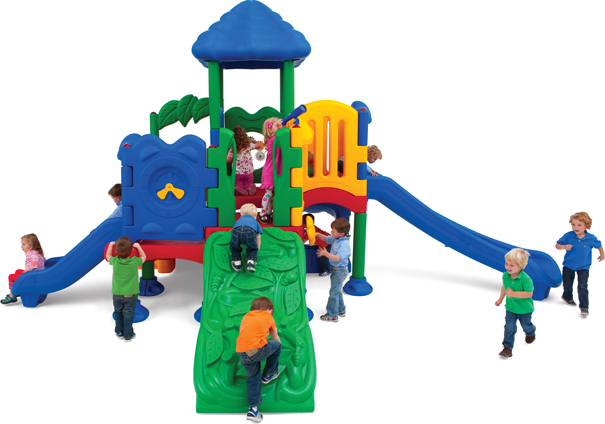 Developed for daycares, churches, parks and community centers the Discovery Center 5 is a low maintenance, durable playground able to withstand the toughest weather elements and high volume play for many years to come. Commercially compliant to CPSC & ASTM standards and IPEMA certified.